SRL performed its most concentrated show ever on Dec 15th 2001. Packed into the lot at 1010 Murray St., presided over by Jim Mason and known as "The Shipyard" was an infernal collection of machines ranging from the newest / loudest, (Hovercraft), to the most dangerous, (The remote controlled Pitching machine). Also included was the latest PeopleHater Ape fighting technology, as well as some old favorites like the Inchworm and 2 moldy Sneaky Soldiers, upgraded just for this event!! Sum it all up and we had one exciting 35-minute crash and burn. See Pics, Video coming soon!! For the 500 people who made it from word of mouth information alone congrats on squeezing into one of our best events ever. For all those who did not hear about the show we regret that this event could not be made public. 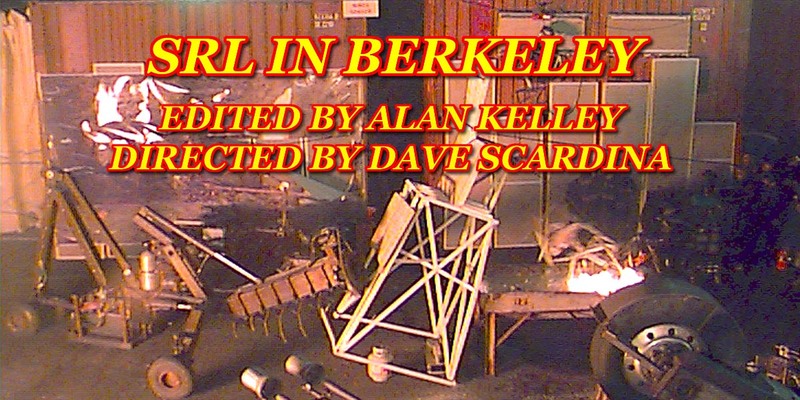 There was room for only 500 audience and the prospect of several thousand people milling about on a Berkeley sidestreet would have risked police intervention and another cancellation ( as occurred at Ace Junkyard earlier this year). For those of you who are of a proactive bent and are interested in viewing an SRL show in this area, I suggest writing a letter to both Tania Bauer at the San Francisco Fire Dept Fire Commission (tania_bauer@ci.sf.ca). and to Willie Brown's office (damayor@ci.sf.ca.us). Ask the SFFD to lay off the harsh and unreasonable limits imposed on SRL shows in this area.